The series of commemorative Newfoundland stamps issued in 1919 memorialize the valiant contributions of Newfoundland's military forces in World War I. The twelve Newfoundland stamps shown above were issued on January 2, 1919, about eight weeks after the armistice, to commemorate the Services of the Newfoundland Contingent during World War I. For descriptive purposes, these stamps are best separated into two different groups. I have done this with the images above and with the catalog details below. When placed on an album page in denomination order though, the two groups will be mixed. The first group of stamps are inscribed Royal Naval Reserve, and these refer to the contributions of the Royal Newfoundland Naval Reserve forces during World War I. Each of these stamps is also inscribed with the Latin word "UBIQUE", which means "EVERYWHERE". 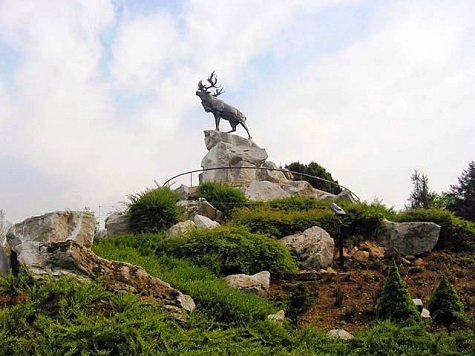 The second group of stamps are inscribed Trail of the Caribou, and these refer to the contributions of the Royal Newfoundland Regiment ground forces during World War I. Each of these stamps is inscribed with the name of a military engagement in which Newfoundland troops took part. Collectively though, these stamps are referred to as the Trail of the Caribou Issue by philatelists. The stunning set of small-sized, pictorial definitive stamps shown above were issued between 1923 and 1924. These Newfoundland stamps are engraved, and with only one exception, their designs feature beautiful landscapes. The 1 C. and 2 C. denomination stamps were also issued in booklets. 1 C. (1923 - Scott #131) - Twin Hills, Tor's Cove. 2 C. (1923 - Scott #132) - South West Arm, Trinity. 3 C. (1923 - Scott #133) - War Memorial, St. John's. 4 C. (1923 - Scott #134) - Humber River. 5 C. (1923 - Scott #135) - Coast of Trinity. 6 C. (1923 - Scott #136) - Upper Steadies, Humber River. 8 C. (1923 - Scott #137) - Quidi Vidi, near St. John's. 9 C. (1923 - Scott #138) - Caribou Crossing a Lake. 10 C. (1923 - Scott #139) - Humber River Canyon. 11 C. (1923 - Scott #140) - Shell Bird Island. 12 C. (1923 - Scott #141) - Mt. Moriah, Bay of Islands. 15 C. (1923 - Scott #142) - Humber River near Little Rapids. 20 C. (1924 - Scott #143) - Placentia, from Mt. Pleasant. 24 C. (1924 - Scott #144) - Topsail Falls, near St. John's. Beginning in 1920, the 30 C. denomination stamp of 1897 was overprinted in black and revalued to 2 Cents (Scott #127). Stamps that are overprinted in red are un-issued color trials, and they are rare. Also in 1920, the 15 C. and 35 C. denomination stamps of 1897 were overprinted in black and revalued to 3 Cents (Scott #128-130). They are all shown above. There are two types of the overprint on the 15 C. denomination. The first type, which is scarce, has the horizontal bars with narrow spacing. The second type, which is common, has the horizontal bars with wider spacing.